P. Diddy likes to brag about having the biggest yacht, the most expensive parties, the grandest houses and more. Now he's been ordered to pay what could be the biggest child support order in New York state history, and he's not happy. Last month, the New York State Supreme Court's Appellate Division approved an increase from $5,000 to $21,782 per month to P. Diddy's ex-girlfriend, Misa Hylton-Brim. Representatives of both P. Diddy and Hylton-Brim say it's the highest child support payment in state history. In an interview with The Associated Press Tuesday, the hip-hop mogul vowed to appeal, saying the case was an attack on his character. "It's not about money. I don't care how much money I have," he said. "If you come at me and say I don't take care of my child, I'm going to take care of that to the end." He vowed to take the case to the Court of Appeals, the state's highest court. In addition to child support, P. Diddy said he also pays for his 11-year-old son Justin's health insurance, tuition, vacations, clothes and other items, for a total of about $120,000 per year. Last year, Hylton-Brim sued P. Diddy seeking $35,000 a month in child support while she was divorcing the father of her other children. P. Diddy claimed she was seeking "adult support." He said the new payment is an injustice, noting that billionaire Ron Perlman was ordered to pay about $12,000 in his child custody case several years ago. "I do take care of my child to my fullest, that's something that should be rewarded. It's not something that should be handled this way," he said. Hylton-Brim's lawyer, Brett Kimmel, told the AP that she has proven in court that she needs more money. "His claim that $5,112 should do the trick is obviously unreasonable, was not upheld by any court anywhere, and I dare say is reason enough to explain why she felt she needed to go to a court in the first place," Kimmel said. He also addressed P. Diddy's claim that the lawsuit accused him of not taking care of his child: "I don't think anybody has ever indicated in court and otherwise that he's not a good father and he doesn't care about his son." P. Diddy also pays child support to his girlfriend, Kim Porter, the mother of his second child, Christian, who went to court seeking more money when they were estranged. 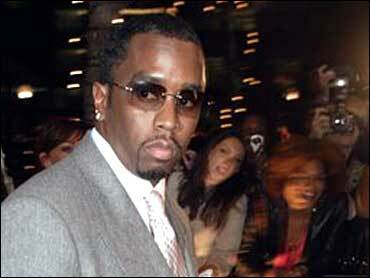 However, P. Diddy said reports that he pays Porter about $30,000 a month were untrue. "She gets $12,000 a month. (But) she pays for everything" including health care, he said. Although P. Diddy claimed Hylton-Brim was driven by "greed," he also said their relationship was good. "I've forgiven her on it, but I'm not going to let up on it."